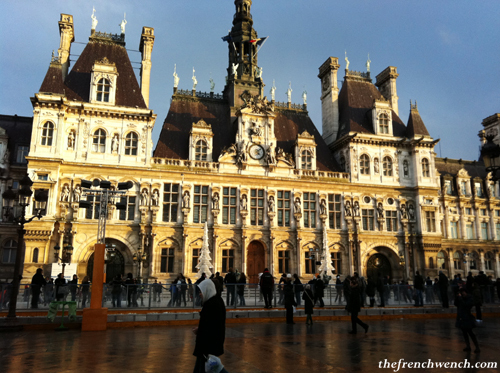 I was soon brought back to reality as I had to buy a RER train ticket to the city. I was certain, now that my credit card was adorned with a beautiful chip, that I would finally be able to use the vending machines and avoid waiting in line at the counters… to no avail! I ended up joining the queue, together with a few British refugees stuck in Paris due to the snow blocking Heathrow Airport… I stopped complaining to myself and thanked my good luck! My childhood friend and her husband were there to meet me at Gare du Nord, and we walked to their home a few blocks from there in the 10th Arrondissement, not far from the notorious Rue Saint-Denis. The snow made it quite difficult to negotiate the slippery pavements, and we witnessed several near-falls from other pedestrians on our way! 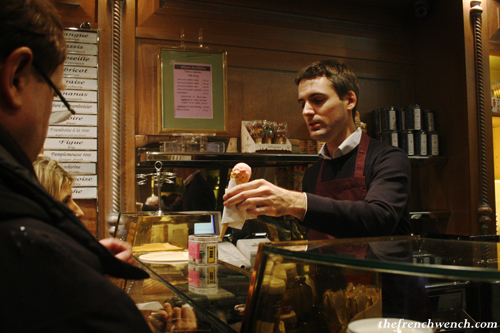 We first went to Berthillon, where even in the heart of winter, tourists queue in order to taste the famous ice-cream! However most people were locals ordering their “bûche glacée” and there wasn’t much left to choose from already! We therefore left with an Apricot & Gingerbread Bûche. Back at the flat, my hosts left me sinking into the couch while they were cooking the duck. I could hear faraway in my dreams some dramatic exclamations and shouts from the kitchen, which made me fear something bad happened to the duck, but it came out perfectly cooked, see the little video below! We had the bûche for dessert, which was really delicious! I would probably never go for Apricot & Gingerbread if other flavours like Chocolate or Vanilla had been available… and that would have been wrong, because it really was a great match! 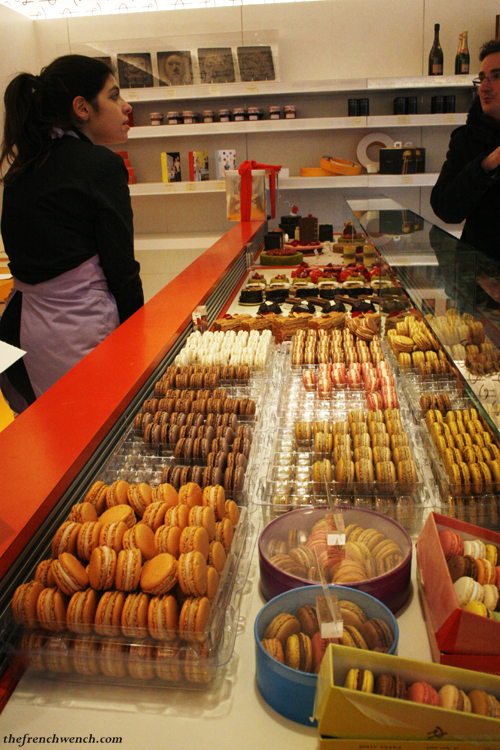 The following day was dedicated to more food shopping, including a trip to the shop of famous Macaron master Pierre Hermé. 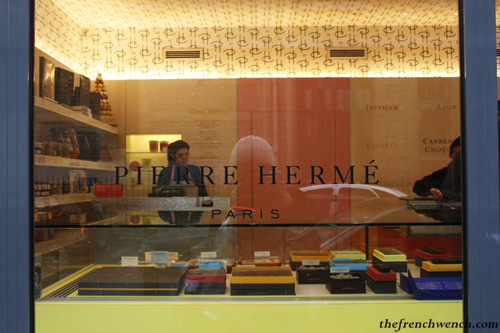 The picture policy of the shop was quite strict, as I was only allowed to take 2 pictures unless I contacted Pierre Hermé’s PR department… We saw Hermé’s best-known macaron, the Ispahan, but didn’t buy it, which I now regret! 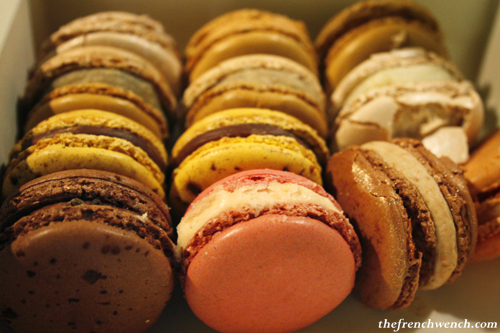 It was difficult to chose from all the lovely flavours, but finally set our choice on a box of 12 macarons. The flavours we chose were: Rose, White Truffle & Hazelnut (very fragrant! ), Quince & Rose, Milk Chocolate & Passionfruit, Chestnut & Green Tea, Chocolate, Salted Butter Caramel, Crème Brûlée… I couldn’t recommend one in particular, they were all delicious! 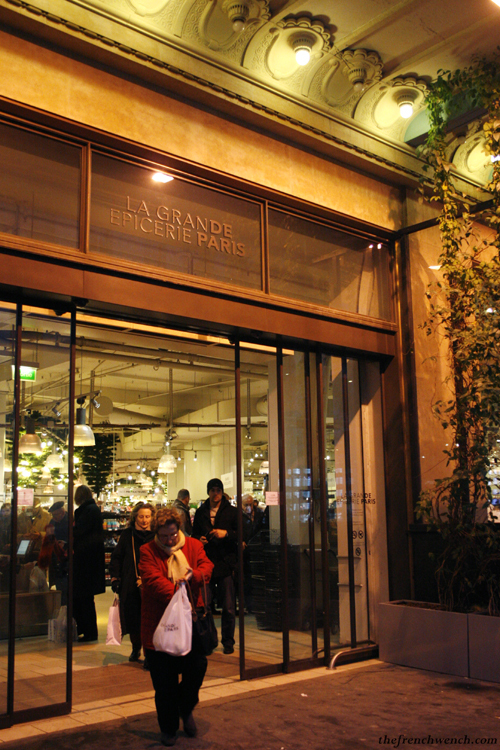 We then walked to La Grande Epicerie de Paris, located in the same building as Le Bon Marché, which was buzzing with BCBG (“Bon chic, bon genre”) people doing their last Christmas shopping. 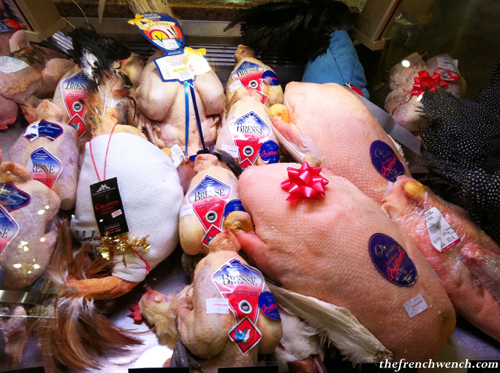 There was an opulence of fine food all over the shop (poultry, foie gras, truffles, caviar, smoked salmon, all kinds of seafood, chocolate… you name it), and hundreds of customers trying to make their way between the shelves… it was a bit oppressive! 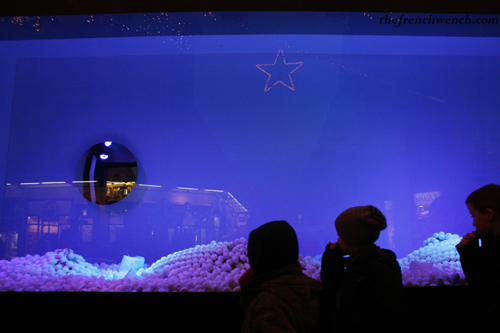 We finally made our way out and walked along the windows to admire the Christmas displays and lights. The hues in the windows were changing every few seconds and all the streets were illuminated… Paris at that time of year is really beautiful, there is a sort of magic about it! Some friends and their little girl were expected for dinner that night, and a nice raclette was planned for the occasion. 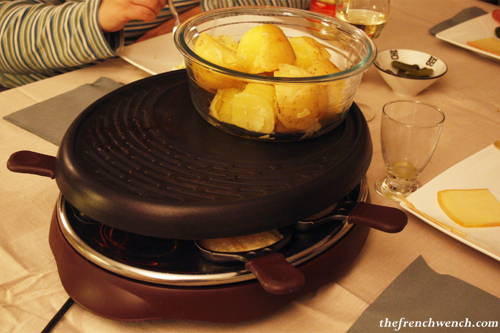 The raclette set means each guests fries their own cheese under the grilling machine at the centre of the table, and pours it on boiled potatoes, accompanied with ham, smoked ham, salami, cornichons… it is very convivial and perfect for that type of freezing weather! I think the pictures speak for themselves! Once more jet-lag got the better of me and I was soon unable to keep my eyes open and string a sentence together. I dug deep down to find the strength for a glass of “digestif” though, a delicious Armagnac, which finished the job of putting me to sleep! And thus unfolded my last evening in Paris… Another trip, albeit shorter, was awaiting me the following day: I was taking the T.G.V to return to my hometown, yay! This entry was posted in French Specialties, Travel and tagged Berthillon, La Grande Epicerie, Le Bon Marché, Macarons, Paris, Pierre Hermé, Raclette. Bookmark the permalink. What an AWESOME post. 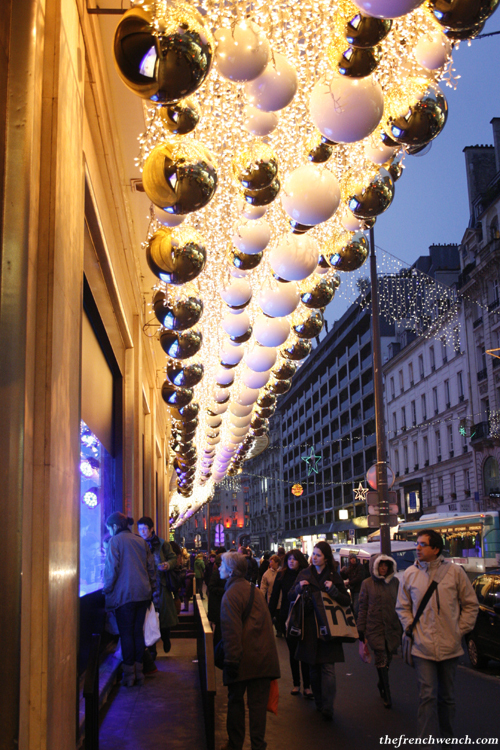 Your French Christmas looks amazingly beautiful. It makes me wish I was French and living in Paris…sigh. 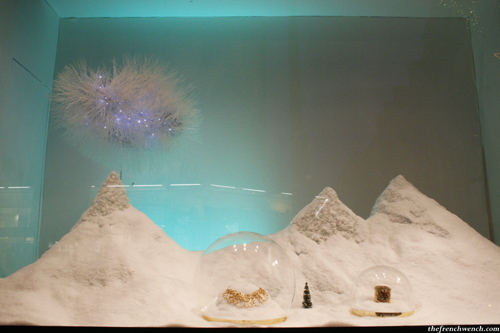 We’re planning a trip next year (or the year after, budget depending) and I will go to Pierre Hermé for sure. I wouldn’t mind trying Raclette too – it looks so tasty. Thank you Melanie, there is more to come! Exciting for your trip to France, you will love it! 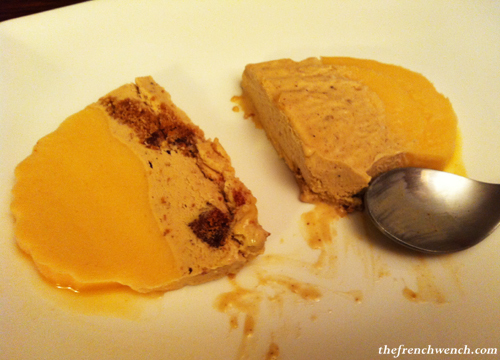 And Pierre Herme is a must-taste! There are so many other patisseries I wanted to visit, but my stay there was too short… next time! Wow only two pictures allowed? So much pressure! lol. 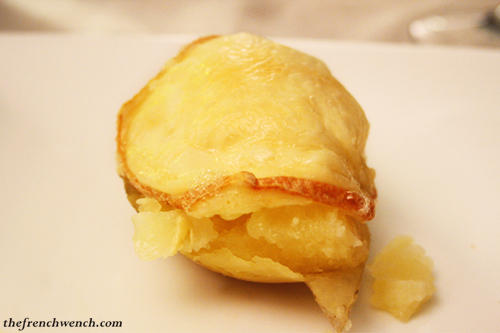 I was excited by the macaron pic but I think I’m drooling more over your potato and cheese combo. What a brilliant supper idea! Hi Helen, there was a bit of pressure at Herme, I’m still thinking about what picture I should have taken instead… oh well! 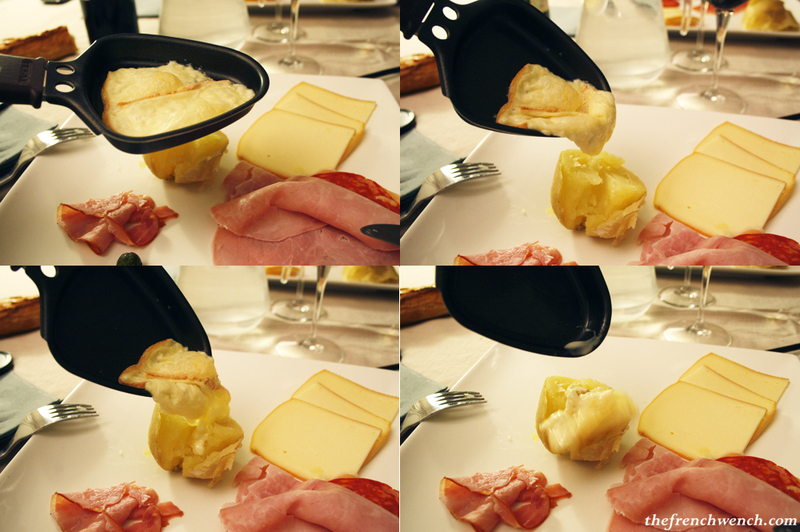 And yeah, raclette is always a winner! French food always looks so classy and tasty! 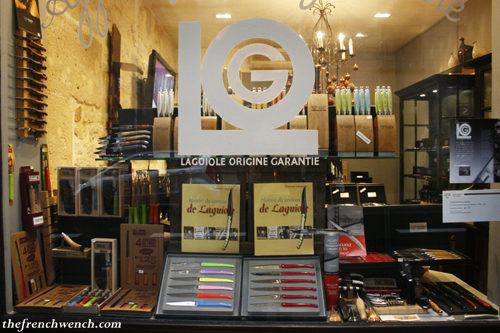 Every time I see Laguiole knives in Paris, I wish I could bring some home! I understand the attraction about the Laguiole knives, they’re so pretty, little pieces of art! I can’t wait for la suite ! Beautiful photos ! Bravo ! This Paris trip seems to have been wonderful! But who are these friends in Paris so lucky? Thank you guys, I had a great time! Oh I wish I’d known about all those fabulous places to shop, especially the icecream shop. 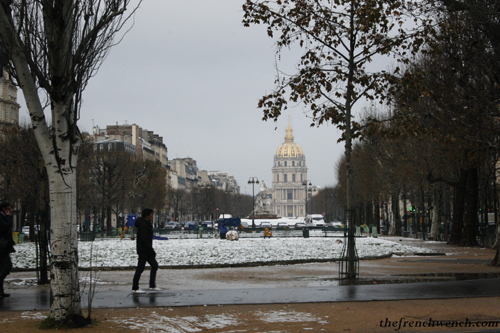 I will just have to visit Paris again – perhaps in the winter this time. Looking forward to your next blog post about your family Christmas I hope. 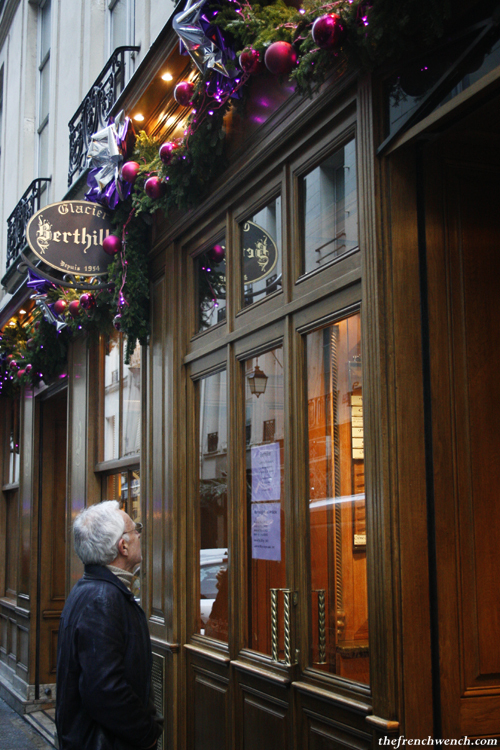 You definitely should visit Berthillon next time, it’s an institution! Oh wow the raclette set, that would be so fun and also delicious. So glad to hear you had a wonderful time .